Elsie Bishop was born (as Elsie Lovett) in Quorn in 1912. She married her husband Roy in 1933 and they lived at 27 Nursery Lane. 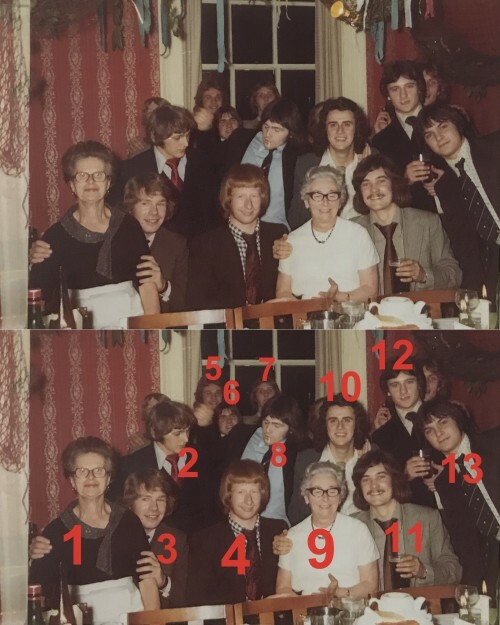 Elsie was a cleaner and waitress at Quorn Hall and this photograph was taken at a Christmas party in the early 1970s. Elsie is in the middle at the front (number 9). Does anyone know any more names? Elsie was widowed in 1957 when she was only 45. She continued to live on Nursery Lane, but in her later years she moved to Skegness to be near her eldest daughter. She died in 2015, just before her 103rd birthday. Missing information: Does anyone know any more names?